As avid bass anglers, we all strive to be good conservationists while minimizing our impact on fisheries. At the same time, however, we also want to show off our catches to our friends and family. This leads us to a prominent question that has been at the center of many spirited debates: What, if any, physical impact does holding a bass have on its jaw? There isn’t much scientific research on this topic, which currently leaves anglers and biologists very little basis for making recommendations. We want to begin to change that. To gain a better understanding of this issue and learn exactly what’s happening to the jaw when held at various angles, we teamed up with Steven Bardin, a leading fisheries biologist and owner of Texas Pro Lake Management. Bardin, along with two veterinarians, Dr. Casey Locklear and Dr. Steven Mapel, designed and conducted an experiment to help shed some light on things. The results and correlating imagery were nothing short of fascinating. Bardin and his team of veterinarians had very specific criteria for this experiment. In order to judge the effects on overweight, trophy-sized fish without actually harming true trophies, they paid especially close attention to the relative weights of each test subject. “We wanted to mimic the body shape and anatomy of trophy-sized fish,” Bardin said. 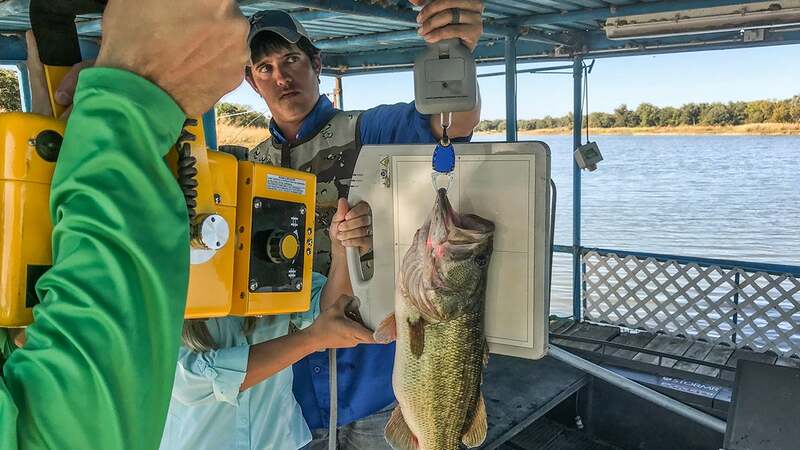 “In order to do this, we captured fish using electrofishing on a private lake that I personally manage. We then selected the individuals that weighed between 2 and 6 pounds with a relative weight of 100 to 125 percent. 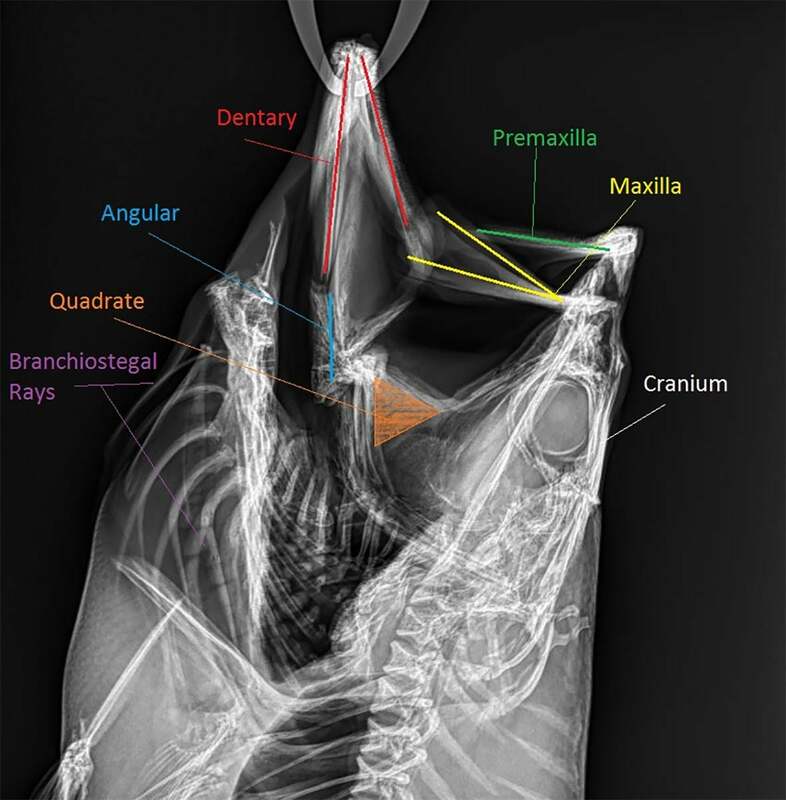 Once the test subjects were captured and their relative weight was calculated, Dr. Locklear and Dr. Mapel of Hat Creek Veterinary Services took detailed radiographs of each bass being held in four common positions. Each fish was radiographed in the order described above to ensure any damage on the jaw would be cumulative based on the potential increase in stress at each position. The veterinarians then examined the radiographs of each position, looking for any noticeable breaks in jaw bones, with an emphasis on the dentary bones that make up the bottom jaw. Based on the radiographic images, the veterinarians did not observe any broken bones in the lower jaw after being held in any position. After further discussion with the team of veterinarians, they explained that broken bones are not as probable as soft tissue injuries in this situation. The absence of broken bones is certainly a good thing, but were there any other soft tissue injuries that occurred? 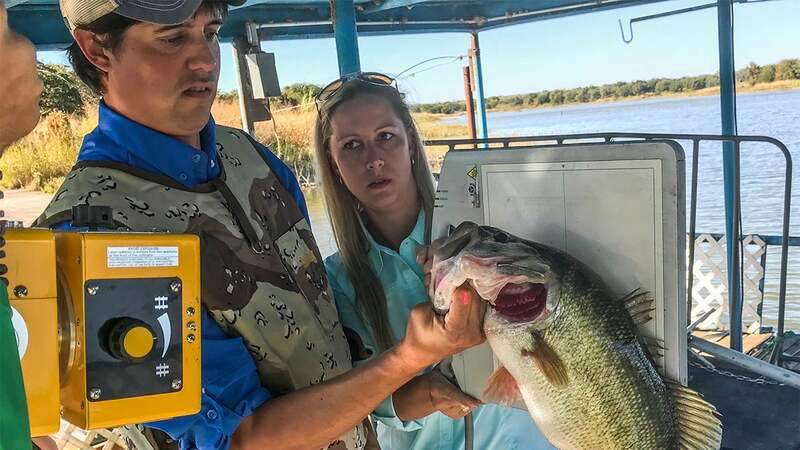 “There is very little reference material or studies regarding soft tissue injuries in a bass jaw, so we carefully attempted to isolate specific joints and bone junctions (symphysis) that were potential locations for injury,” Bardin said. “These areas of interest are places where excessive pressure would likely be applied or over-flexion or over-extension of the joint could occur. Potential areas of concern in the lower jaw were found to be the mandibular symphysis, located centrally where the left and right dentary bones meet, and the joints where the angular bones and the quadrate meet. “The mandibular symphysis is not a joint, but a location where two bones meet with cartilage between them. They are not fused like a human’s bottom jaw, so there is slight mobility in this area. I found that each dentary bone could move slightly, but mobility in this area became much greater as we increased the weight of our test subjects. “When you hold a bass by the lower jaw, you usually place your thumb onto, or to either side of this symphysis, and your fingers fit directly behind it. So in some of the holding positions, you put excess pressure on this area. Professional angler Gary Klein, who I asked to observe the experiment, mentioned he has actually caught fish in the past that had a visible separation of this symphysis. Are these soft tissue injuries dangerous or life threatening? 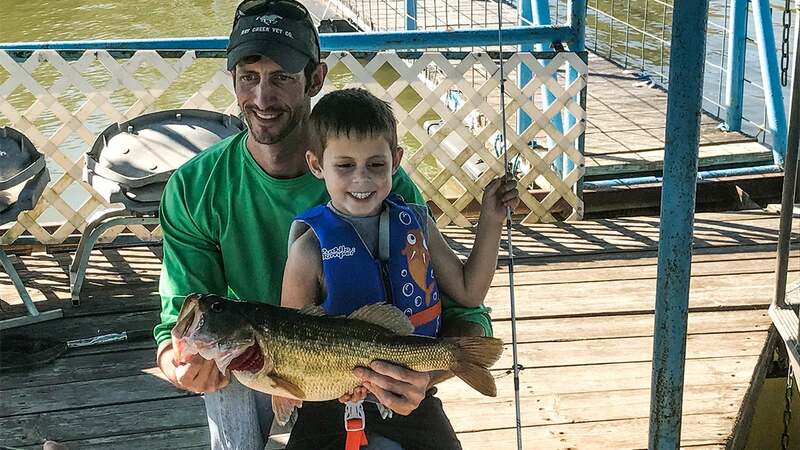 “Due to a lack of industry research, we honestly don’t know how an injury like this affects a fish, nor do we fully understand the recovery period for these injuries,” Bardin said. “For humans, spraining an ankle, dislocating a shoulder or any other soft tissue injury can take a much longer time to repair and recover from than a clean break of a bone. In fact, these injuries can increase the potential for reinjury and, in many cases, cause further instability. It’s also important to understand the impact that the fish’s size had on a potential injury. According to Bardin, there was definitely a correlation between the two. Larger fish do require an increased emphasis on proper fish handling, by supporting their weight with a second hand. Applying too much pressure to soft tissue areas can cause damage. Many state agencies claim anything greater than any angle that deviates 10 percent or more from vertical or horizontal has the potential to damage the jaw. Holding fish with a fish grip or by a hanging scale is beneficial. The recommendation that it is acceptable to hold fish horizontally with a second hand supporting its weight or completely vertical is still valid and supported by our research. Holding fish vertically with the weight of the fish being placed on the jaw in an exaggerated fashion is not acceptable. Injured fish will likely swim away and appear completely normal. Long-term affects of soft tissue injuries are currently unknown. As an industry, we certainly need to expand this research by looking at both the short and long-term effects of possible soft tissue injuries to the jaw. How does this affect feeding and the ability of these fish to compete? Do the fish have a lifelong injury or higher potential for reinjury? In the meantime, it’s important to do everything we can to care for these trophy bass for the short time they’re in our possession. Although the fish may swim away normally, it’s always best to err on the side of caution and handle these fish the best way we know how.